The Premier Fighting Championship 7 is just days away with, perhaps, the promotions biggest card to date. The main event for their 7th card is a well-published clash between UFC veteran Dany Lauzon and Anthony “Violence” Kaponis. While N.E.MMA News previewed the bout as a definite must-see, with 2 hungry fighters that are looking to make headlines, its the welterweight bout before it that is worth as much or more of the spotlight this weekend. Two top east coast fighters will meet in the ring on Saturday night in a bout that could decide who is at the top of the 170 pound division in New England and could have a significant instant career impact. “Golden Boy” Ricardo Funch, fresh off of a 2-fight stint in the UFC, returns to the regional scene with a 7-2 record to take on 3-time Bellator fighter Ryann Quinn. Quinn will enter with a 6-2-1 record, unbeaten in his last 4. He is undefeated fighting for Bellator, with wins over the highly regard Matt Sung Lee, Bombsquad’s Mike Winter, and Brett Oteri which took place in his last bout in August. Funch was undefeated before entering the UFC, with wins over Chandler Holderness, Woody Weatherby, and the UFC’s T.J. Waldburger. He dropped his UFC debut via decision to Johny Hendricks in 2009 and his second bout in 2010 by way of 2nd round submission to (14-1) Claude Patrick, who is undefeated in the UFC. While both fighters have fought extremely well, holding more than their own against top-level talent, this bout may come down to the fighter that is more hungry. Quinn and Funch have almost identical records but the glaring difference may come down to ‘time off’. The Connecticut native Quinn has already fought 3 times this year, including the Bellator wins over Oteri and Winters. 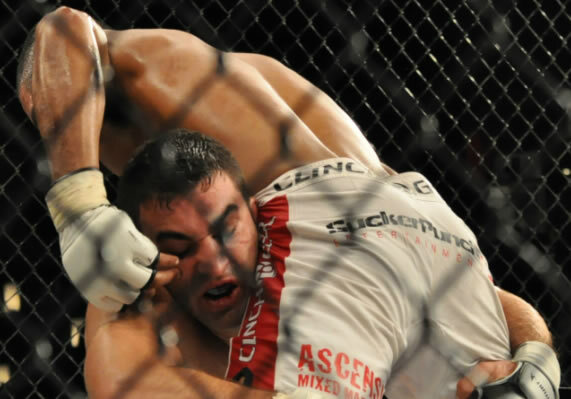 Since his last loss he has showcased his diversity in winning fights, with victories by TKO, Submission, and Decision. Funch, a Massachusetts native, has not entered the ring in almost a year and a half since his last UFC fight. He also fought only once in 2009, the other UFC bout. In that same time period his opponent Quinn fought 6 times; 3 being on the Bellator stage. Expect both fighters to leave fans with very definitive opinions of their futures. Spectators should see from the opening bell just how serious Funch is about his MMA career and hope hungry he is to get back to the “show”. A win by an obviously-dedicated Quinn will most likely see his exit from the regional scene, with a major organization likely to sign him to a multi-fight contract. With huge career implications for both fighters on the line, the question will be answered on Sautrday night in Amherst Massachusetts; Who is ready to move on/up and who takes a step back?. The Premier Fighting Championship 7 takes place on Saturday night, December 3rd at The Mullins Center at UMass in Amherst, Massachusetts. Dan Lauzon vs. Anthony Kaponis is the main event, with other noteable bouts besides Funch-Quinn including Rich Moskowitz vs. Abner Lloveras, Tyson Chartier vs. Steven Carr, Rob Font vs. Matt Tuthill, and the professional debut of Lowell Zangri.